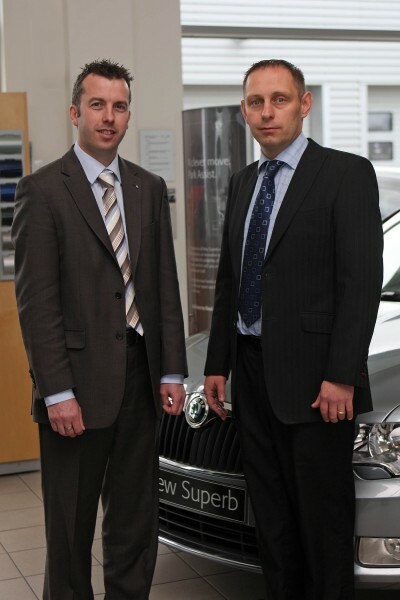 Carrs of Cornwall has strengthened its recently acquired Skoda franchise based at Indian Queens with two new appointments. Andrew Cook, who joined the group as a Volkswagen sales representative a year ago, has now become sales manager for the Carrs Skoda operation, which covers the whole of Cornwall. His colleague Spencer Knibb, who has been Volkswagen after sales manager at the Indian Queens centre for a number of years, has now added Skoda responsibilities to his list of duties. “Andrew and Spencer have both demonstrated outstanding ability and commitment and they will play a leading role in the further development of our Skoda business,” said Carrs franchise director Jon Keast. Carrs took over the franchise from Mid-Cornwall Cars at Roche last summer, absorbing the operation into its state of the art Indian Queens centre opened two years earlier. Andrew Cook, formerly from Burnham-on-Sea in Somerset and now living at Truro, has also been involved in the motor cycle and bathroom industries in a sales career spanning 12 years. Spencer Knibb has been with Carrs for many years. He has been working with Volkswagens since the age of 16, having joined the original Renwicks operation based at Threemilestone before Carrs acquired that franchise in 1994. He lives at Lanner.